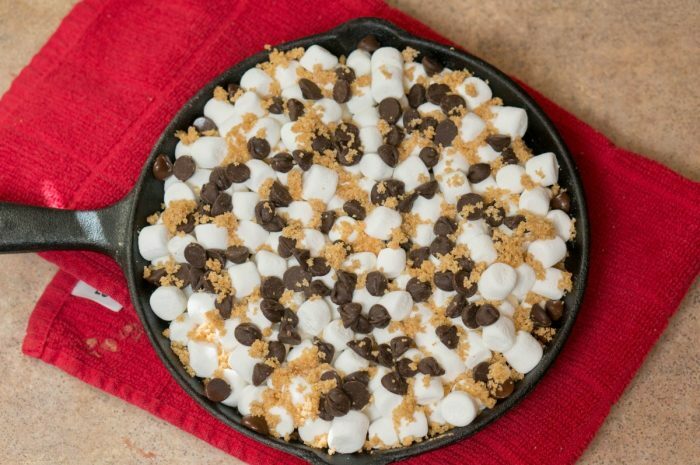 Our yummy S’mores Cookie Bar and Dip combines all your favorite flavors – graham cracker cookie crust, loads of chocolate, and a pile of marshmallows! Is there anything more completely irresistible than S’mores? There’s just something so magical about those three basic ingredients pulled together to make a dessert so crave worthy, it begs to be eaten and shared. 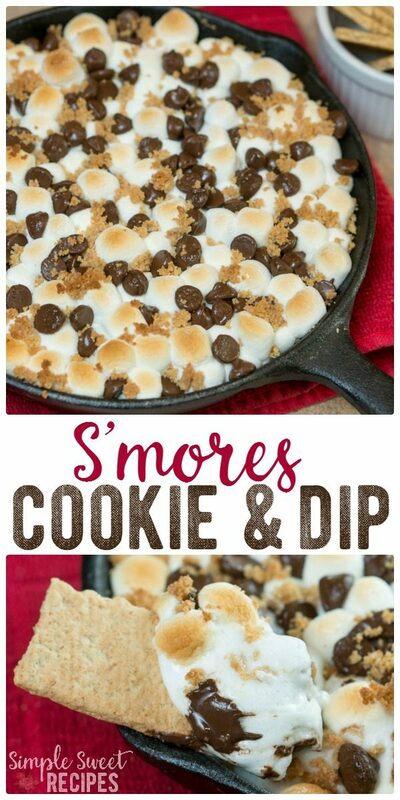 I love s’mores because they bring back all the warm fuzzies of summer camping trips, and none of the dirt! Even if it’s the middle of winter, this is an amazing dessert to warm you up and remind you of sunny days. 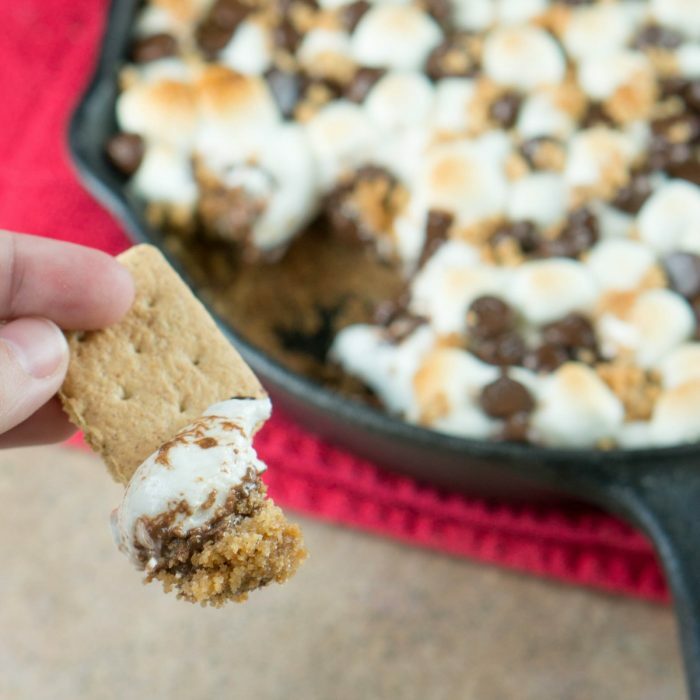 Serve it right from the cast iron skillet with a tray full of graham cracker cookies for dipping. Or wait, if you can, for the cookie to cool and cut it up into bars and serve. It will be soft (and gooey and amazing) if you cut it when warm. 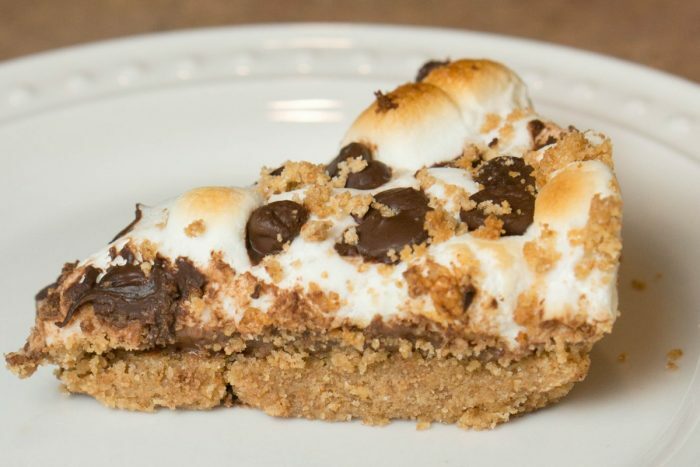 If you wait an hour or two until the S’mores cookie bar cools, it will cut into beautiful cookie slices that can be picked up. 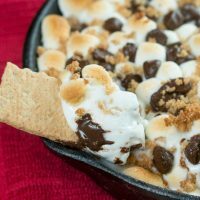 Our yummy S'mores Cookie Bar and Dip combines all your favorite flavors - graham cracker cookie crust, loads of chocolate, and a pile of marshmallows! Prepare your cast iron skillet with 1 tablespoon of softened butter, coating the bottom and sides of the skillet. Place your graham crackers into a food processor and pulse until fine crumbles. Add remaining butter, sugar, and vanilla and process until well combined. 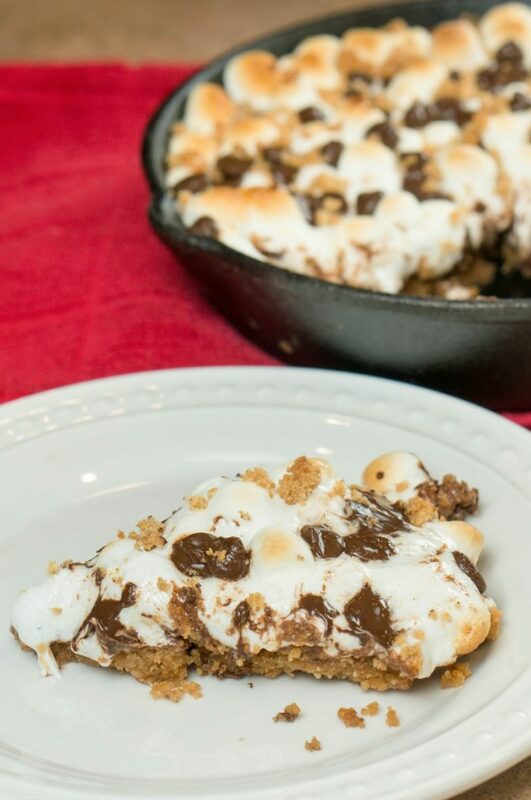 Press graham cracker cookie crust into the bottom of your prepared skillet, reserving about 1/4 cup aside. 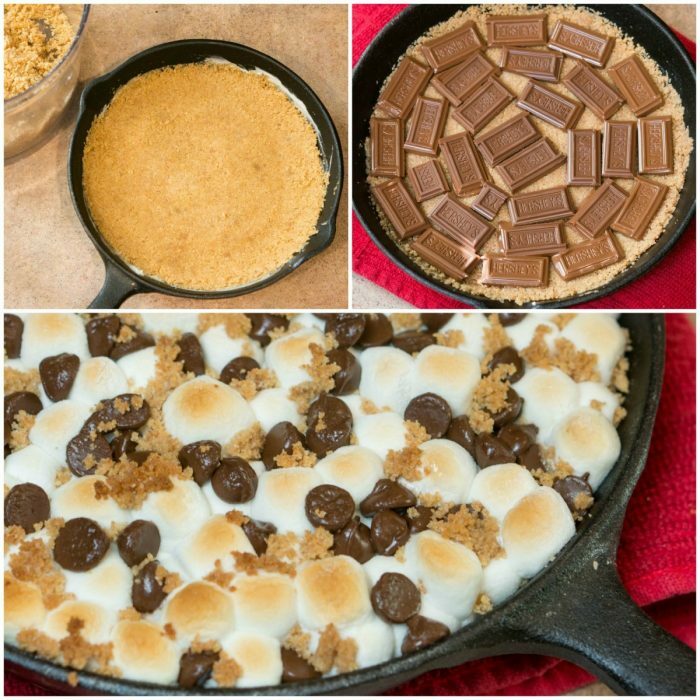 Remove from oven and line the graham cracker crust with the chocolate bar, broken into smaller rectangles to fill the space. Cover generously with mini marshmallows until you can't see the chocolate layer. Sprinkle with chocolate chips and crumbles of your reserved crust. Bake at 350°F for 5 minutes. 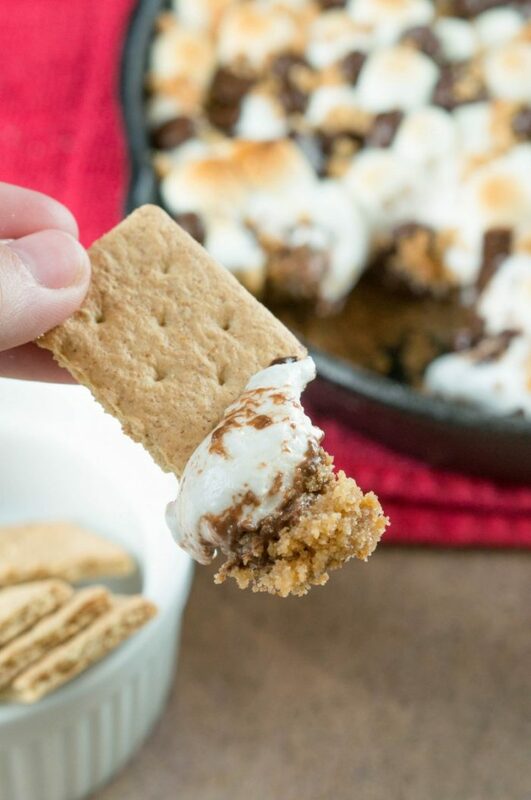 Switch to broil, and bake watching closely for 1-2 minutes or until marshmallows are golden. 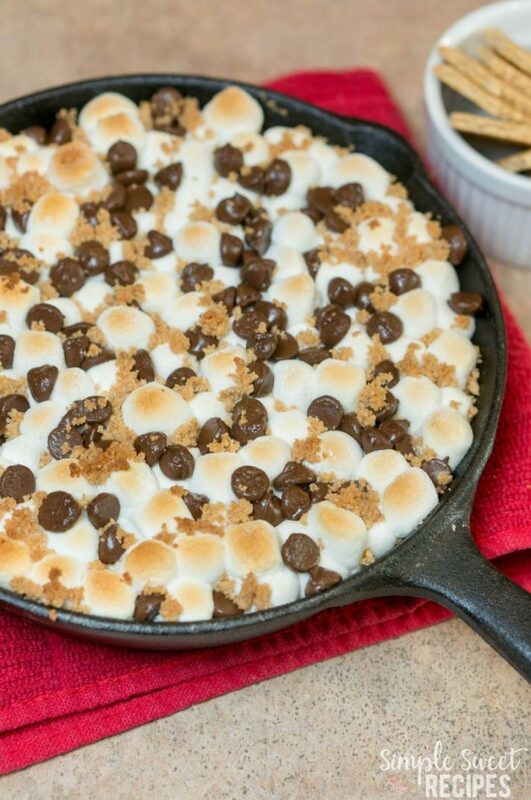 All you had to say was the word Smore’s! 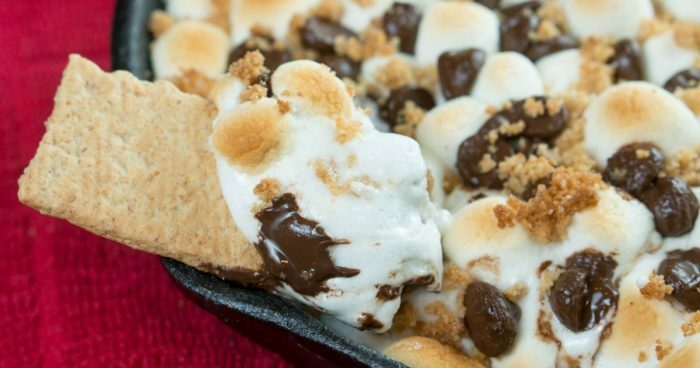 I like anything and everything that has to do with Smore’s. I cannot wait to eat this. Do I have to share it really? Will you deliver some to me? This is so ridiculously delicious looking- I want to scream! I definitely pinned this! It looks sooooo good! My son would love it! I can’t wait to make it! Oh that looks absolutely delicious! Even better than smores outside when camping. Much less messy and it would be a great dish to have for our next game night! What a yummy treat for the whole family! This would be great on a cold winter night to have around the fireplace. I love this idea! Can you tell me what size iron skillet you used? Such a fun summer treat! My son would go crazy over this. He loves S’mores! And I love to make things in my cast iron pans. Can’t wait to try this! You can use whatever size you have. This here is a 6″ skillet.